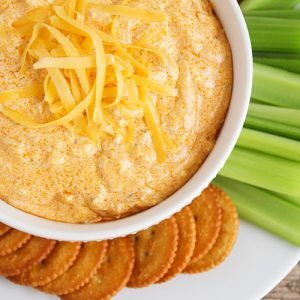 This Delicious Buffalo Chicken Dip Recipe An Easy Appetizer That Is Sure To Please! Just Throw A Few Easy Ingredients Into Your Slow Cooker And You Will Have A Delicious Appetizer In Minutes! Place chicken in crock pot with ranch dress and wing sauce. Cook on low for 6-8 hours or on high for 2-4 hours. A half hour before serving, take chicken out of crock pot and shred it. Return to the crock pot and add the packages of cream cheese and cheddar cheese. Stir well.